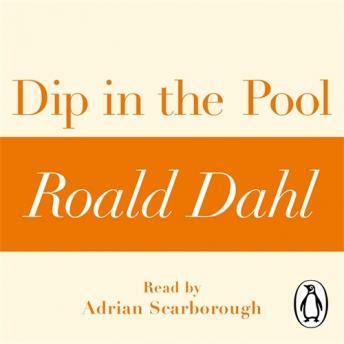 Penguin presents the audiobook edition of Dip in the Pool by Roald Dahl, read by Adrian Scarborough. In Dip in the Pool, Roald Dahl tells an unsettling story of human folly. Here, a man acts rashly and life-threateningly to ensure he wins a prize . . .
Dip in the Pool is taken from the short story collection Someone Like You, which includes seventeen other devious and shocking stories, featuring the wife who serves a dish that baffles the police; a curious machine that reveals the horrifying truth about plants; the man waiting to be bitten by the venomous snake asleep on his stomach; and others.